A brief 3 minute video shot on scene from Gandep Bible College highlighting our trip, Sept 4 – 14. Note: Please raise your volume control for enhanced hearing capability. We just got home from 10 days in the bush of PNG. We left town on Sept. 4 and returned Sept. 14 from Gandep Bible College. 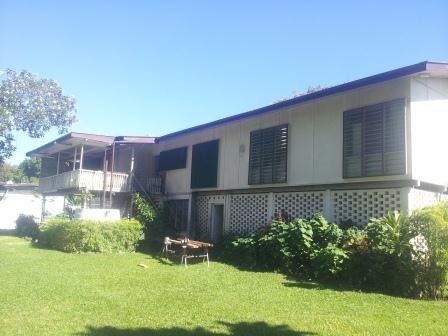 Gandep is located in the rural Madang province. It took a 7 hr. van ride, 6 hr. 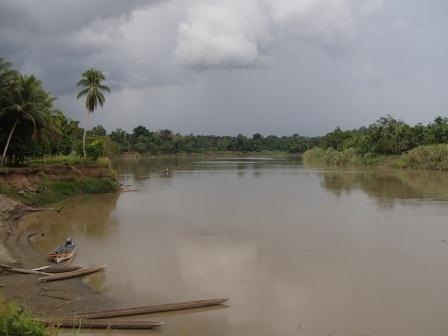 boat ride, and a long 6 mile jungle hike to reach Gandep. We anticipated the tractor to be fixed but it was not so with the help of the students carrying our cargo we made the hike to Gandep. The week’s focus was on one of six courses that PBT teaches. This course was on Bible Storying. Emily taught the principles of taking a story or parable from the Bible and developing skills of how to tell the story. We taught them how to outline the story and how to ask questions. We also encouraged the use of drama, song, and illustrations as well to enhance the story. We broke the class of 34 into pairs and gave each pair a story from the Bible. It was their job to turn the passage of scripture into a story. It was fun to interact with the students as they represented ten different languages. Each morning we had devotions followed by allowing the students to read in their mother tongue language. Some groups have the whole NT while others have a few books. There were at least three languages that had no translation done in their language. We ended the week with a small program highlighting each language group as they presented a song or drama in their mother tongue language. As customary we celebrated with a Papua New Guinea favorite, pop corn. There is pretty much one constant in our lives here in PNG. We regularly produce a monthly newsletter. Time seems to fly and it is an embarrassment to see the last blog post was from the end of June. Well, it has been a very busy past six weeks. 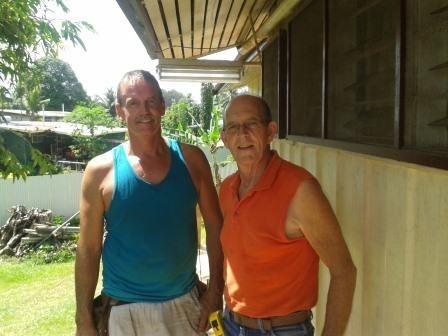 Starting the first of July we hosted two guests who came to remodel a house. 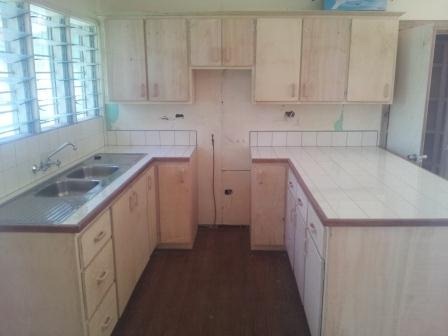 They were tasked with flipping a large 3 bedroom house into two, two bedroom apartments. We did however contract out the plumbing and electrical work. 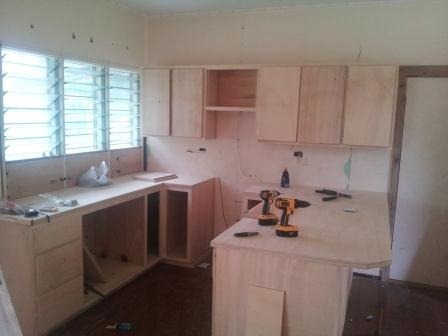 Bob and Andy did the framing, built a new kitchen, and all the finish work such as installing doors, tiling, and much more. Bob and Andy left PNG a week ago Monday. The majority of the work is completed but we are still waiting for the electricians to finish their work as well as paint and finish the floors. My part in all of this was to be the buyer of materials and at times I felt like the superintendent. All I need was a white hard hat to complete the image. Bob sent an initial list of supplies which I was able to purchase before the job started. However, as the project kept moving forward they still needed supplies. It was my job to keep them supplied. It was not infrequent for me to visit three hardware stores in a day and write that many of checks as well. I got to be a familiar face in all the hardware stores in town which helps with getting good discounts as well. Building a good rapport with the local businesses is crucial. From the first of July till now, it has been guns blazing with getting the job done. The reason behind all of this is our team is growing and we need more housing. Praise God! We have been praying for more workers and we all know ‘the harvest fields are ripe but the laborers are few.’ As we prepare for those to come we need to think forward and have the basic need of shelter available. Though the project is not finished, the end in in sight as soon as the paint dries. Emily and I will be going back to Gandep Bible College, Sept 5 – 14. 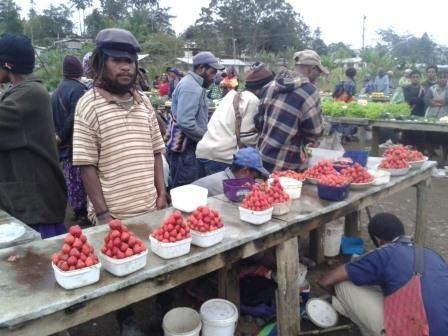 Six months ago in Madang the main town market was closed for renovations forcing new temporary markets to open along many of the side streets. The new temporary main market was moved to the outskirts of town. This has caused problems throughout town and therefore prices to increase slightly. Emily has found a small market she likes to visit frequently for broccoli, carrots, and potatoes. However, there are still some comforts of home that we can only find in the Highlands of PNG. Two weeks ago we made a long weekend trip to Ukarumpa in the Eastern Highlands. 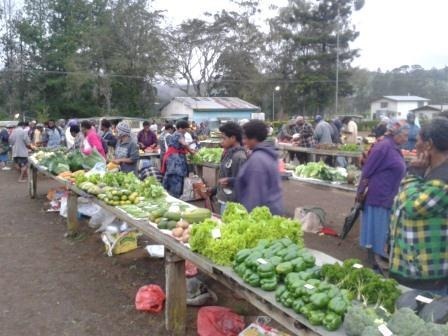 Ukarumpa is the base for SIL in PNG. We went mainly for me to receive of shipment of solar panels that were sent from North Carolina via ocean container back in February. We also took the opportunity to have teeth cleanings at the dentist and visit friends. The highlight of the trip was to visit the local market on Friday for fresh highlands produce. 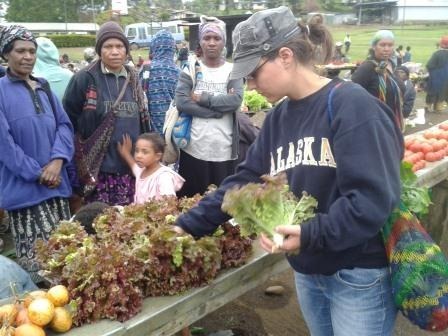 Emily has a strong desire for strawberries that are only grown in the highlands and cannot be found in Madang. The small local market is only open on M, W, F from 6 – 8 am. Early Friday morning we made the short trip to the market to load up on highlands produce such as lettuce, berries, carrots, and rhubarb. It was my job to be the money man while Emily took the joy to buy, buy, buy. We walked away with quite a load of produce which we are glad that we had the truck. Of course I planned my Friday accordingly to be out of the house so I did not have to be involved in the washing, cutting, and chopping of the market produce which took the rest of the morning. After freezing the berries and rhubarb all weekend, we loaded the travel freezer full of goodies and headed back from Madang. Are there qualifications or requirements to meet to be apostles of Christ or a missionary or even a national Bible translator? I suppose there are some standards to follow though as I have been reading Luke’s chronicles of Acts there seems to be a different drift. The early apostles were no one special. They didn’t have special Bible schooling or a diploma to display on the wall from some Bible College. They were unschooled. Though one could make the case that Peter, John, and the rest were schooled by the headmaster himself, Jesus. There was no teacher assistant or aide. It was Jesus in the flesh giving parables and live illustrations. Jesus ascended into heaven (Acts 1) and left the begins of the church to his faithful eleven. Peter, rock, received the Holy Spirit and became a man of courage. Peter heals a lame man then starts a preaching crusade (Acts 3). Peter, the man you denied Christ three times and now has been transformed by the Holy Spirit is working miracles and preaching the Gospel. Remember, Peter is an unschooled, ordinary man. 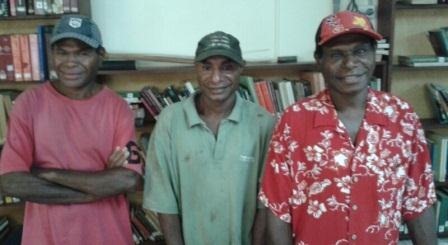 When I think of national translators such as the men PBT typically works with in PNG, they are merely unschooled and ordinary men. Yes some have a grade 10 or grade 12 education though some have grade 3 or 4 level education. Still God uses these ordinary men to do the extraordinary work of Bible translation. As the Sanhedrin were astonished, I am astonished as well to see God’s handiwork in action as these men work to translate the Good News in their heart language. One of the joys of working with Pioneer Bible Translators is the ability to meet national co-workers such as Siria. Every morning I would poke my head into his office space and see how he was doing. Siria and I would small talk, smile and I would encourage him as he often gets discouraged from the process and others. As times I would encourage him to take a break and enjoy some hot tea or coffee to give him a rest. Siria is a member of the Aruamu translation team. 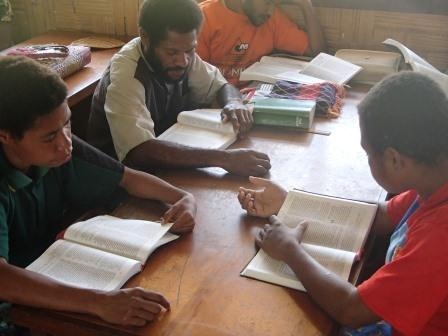 Back in 2005, this language group in north Madang Province dedicated the New Testament. This language group is now working on the whole Bible. 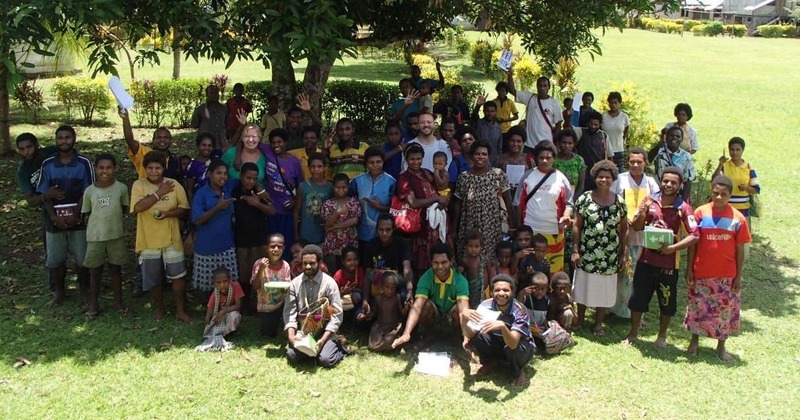 The Aruamu translation team hopes to dedicated the whole Bible in 2020. Ov er the past month, Siria along with another member of the team came to town to draft parts of the Old Testament. Siria (pictured) is doing his part in the long process of Bible translation by completing the first step of drafting. 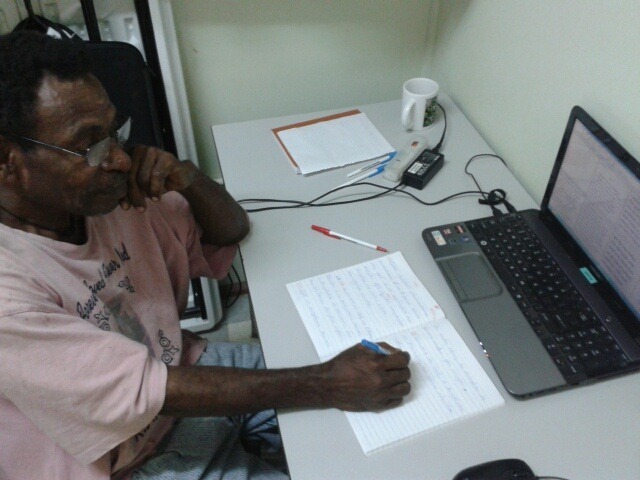 He is using the trade language of PNG, Tok Pisin, as a base layer to translate from. The Tok Pisin language has a complete Bible allowing Siria which he can read and understand to draft into his language, Aruamu. Siria was tasked to draft the book of Deuteronomy. Siria reads the Tok Pisin, then does his best as in the sense of drafting into his local language, Aruamu. This is the very first step in the very long process of Bible translation. Siria is pictured writing in his notebook and using the computer program, Paratext for language resources such as the Tok Pisin Bible. Later, he will type his rough draft of Deut. into the computer program for others to check and edit. Thank God for men like Siria who are working tirelessly to translate God’s Word into their language. Siria left his family, home, and garden to come to town which is an overnight truck ride to work. Pray for Siria that God will use him mighty to help translate the Old Testament for the people of the Aruamu language group. Pray for the translation team that they will complete the whole Bible by 2020. Praise God that they have the New Testament as of 2005. Last weekend was a long holiday for us in PNG. In PNG, both Good Friday and Easter Monday are national holidays which means the office is closed. We get a four day weekend to celebrate the resurrection of Jesus! Holidays in a different country and different culture are not the same as our home country and home culture. Believe it or not, they don’t do the same things or have the same rituals as we do in America. But that is okay because we are not them and they are not us. However, this makes holidays such as Easter somewhat difficult to celebrate as our customs and traditions don’t match. No Easter egg hunts, no spring flowers, no change of seasons and the coming of spring, nor the tradition songs of Easter…’Up from the grave He arose’. Though their is one universal standard, Jesus rose from the dead and He is alive! On Easter Sunday, we did celebrate the resurrection or in Tok Pisin, Jisas i kirap bek. 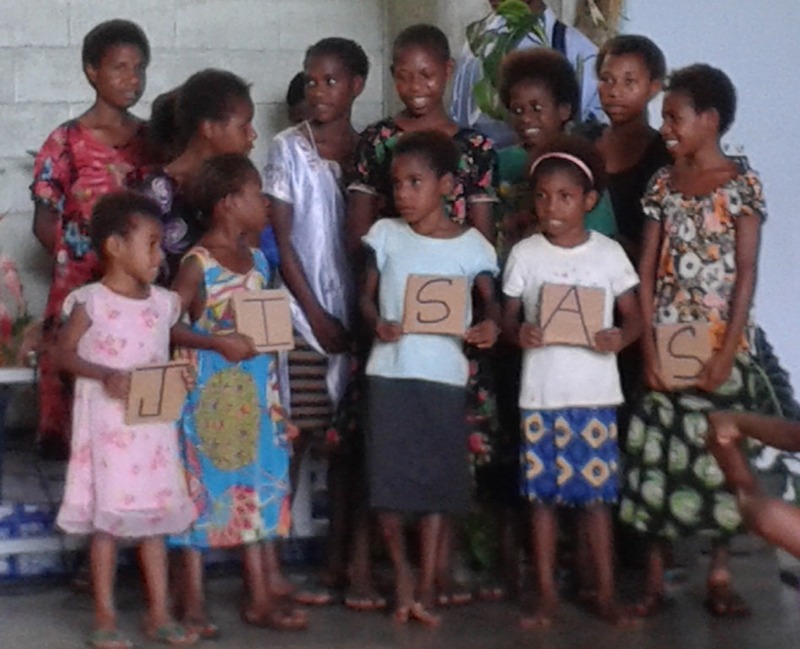 The Sunday school children sang a special as they held the five letters that spelled the name, J-I-S-A-S. How fitting than to sing about the one who defeated death, overcame the odds of his disciples, and left the tomb empty on that glorious morning. The story is the same no matter what language is spoken, Jesus died and rose on the third day to live forevermore. Isn’t it amazing that God’s Word transcends all boundaries, cultures, and languages? We may live in a different country, speak a different language and cater to a different culture but one thing remains the same, Jesus overcame death and is alive today. Now the challenge is to translate that story into the many languages awaiting to read it or hear it in their heart language for the first time.